Looking for a elegantly styled device with a high-performance chipset? 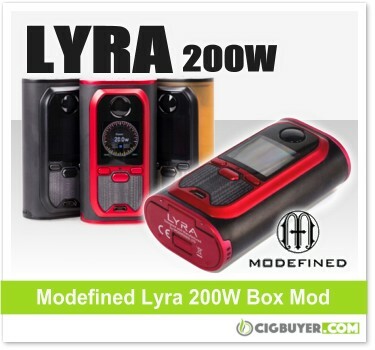 Check out the new Modefined Lyra 200W Box Mod (by Lost Vape). The Lyra 200W Box Mod features a soft contour body made from die-cast zinc alloy and ultem with a anondized aluminum control face. Available in several attractive two-tone designs, it’s powered by dual 18650 batteries and provides up to 200W of output with precision temperature control (Ni/Ti/SS), TCR and bypass. The Modefined Lyra 200W Box Mod includes a large, user-friendly 1.3 inch color OLED display, 3-button control interface, oversized firing button, latched bottom battery access door and a micro-USB charging and upgrade port.